The 11 Best Wineries in Indiana! Indiana is home to a flourishing wine industry, with wine trails waiting to be explored by casual wine drinkers and connoisseurs alike. As Indiana’s wine-grape horticulture continues to grow, be sure to stop into one of these 10 excellent wineries, crafting artisan vintage from superb fruit. This winery started a few years ago and is growing rapidly with a delicious variety of wines crafted from more than just grapes. Their selection of fruit wines offers something new and refreshing for your table. They work to regularly release new vintages of fruit, dry, and table wines. They occasionally hold open houses for you to listen to some great tunes, sip on their wines, and relax with friends old and new. Local guests pronounce the name a dozen different ways, but they all say, “Mmmm!” Tonne Winery on the north side of Muncie features a 1500 square-foot tasting room decorated with the work of local artists. Regularly, an evening of live music and tasting allows you to sip in good company with local connoisseurs. Is there anything the Nashville doesn't have? Our treasured little town of Nashville in the south of the state is home to the perfect blend of nature and refinement. The Brown County Winery features local wines of excellent quality and craftsmanship, and (oh joy!) offers free tastings daily. In addition to their winery, they also have two separate tasting rooms. BCW is also a stop on the Indiana Uplands Wine Trail. Not only is this also a stop on the Indiana Uplands Wine Trail, but it's also close to the majestic and opulent French Lick Hotel and Resort. During your weekend getaway at the resort, featured in the 15 most romantic spots in Indiana, enjoy a fine Italian meal at the Vintage Café and sip a local vintage from the French Lick Winery. The elegant tasting room and grounds of Oliver Winery are truly beautiful. With the nationally-recognized Creekbed Vineyard not far away supplying much of Oliver's wine, the setting for this stunning winery is incomparable. If you book an appointment, you can tour the Creekbed Vineyard, which is, in a word, gorgeous. Oliver's tasting room also hosts several festivals as well as private events. At Fruit Hills Winery and Orchard, you can sip artisan wines surrounded by the beauty of northern Indiana and Amish country, perhaps after a shopping spree at Shipshewana. For a small fee, at your first tasting of the calendar year, you can get a card that will waive your tasting fees for the rest of the calendar year as long as you present your card whenever you come back. Currently, Fruit Hills only holds weekend hours—Friday, Saturday, and Sunday. One house. One business. Dozens of delicious offerings. Wildcat Creek Winery is a Hoosier winery dedicated to providing a wide selection of perfect wines from Midwest grapes. Their tasting room is a homey, inviting house that is open seven days a week, ready to provide a relaxing escape for you and a friend while sampling the fruits of their craftsmanship. Outdoors, there is a Greek pergola with picnic tables for a group tasting experience in the lovely Indiana breeze. J&J is a seasonal winery and café on the eastern edge of the state. Their food menu is truly gourmet, with fine old-world selections that pair exquisitely with their Greek-themed wines. At J&J, you can enjoy a delicious Mediterranean meal without the raucous revelry of the Dionysian festivals. Just you, maybe some friends, a delicious gourmet dinner, and a glass of some of the finest Midwest vintage around. The seasonal winery is unique and exclusive to Indiana … they won't even ship to an address outside the state. It's a treat you can only enjoy when you're in here in the Hoosier state, so make sure to sample the “fruitshine” while you're here. Every piece of fruit is cultivated, harvested, and turned into wine there at the winery, and all using 100 percent natural means and methods. It's a truly unique Indiana treasure that will have you visiting again and again. With two tasting rooms in the state, Chateau Thomas is dedicated to providing exceptional flavors to its guests. Their signature Abe Martin jug series is a favorite. Most notably is Dr. Thomas's innovative wine ha has named “Slender,” since it is both carb-free and naturally sweetened. For a perfect guilt-free sip, visit Chateau Thomas and toast Indiana! Want to make a weekend of wine tasting? Want to experience even more Indiana wines on a nicely laid-out trail around the beautiful Indiana south? Check out the Indiana Uplands Wine Trail, which is basically a grape-flavored pub crawl. 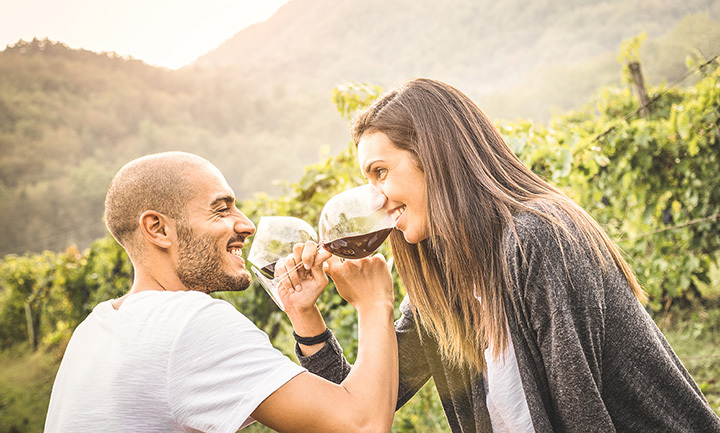 During Wine Trail events, participating wineries and tasting rooms coordinate their offerings to provide you with an unforgettable tasting trail. View more Indiana Wineries & Vineyards.